A wonder-strike from Ciaran Murray and a brace from his skipper Paul Maguire earned Larne three points in a 3-2 win over Dergview. It was more convincing than the scoreline suggests with Dergview’s second arriving in the dying embers of the game. The result moved Davy McAlinden’s men up to third spot in Championship 1. The home side had chances early on with Colin Nixon’s close range header needing a smart save from Jack Beggs. Guillaume Keke then wasted a one-on-one and Conall McGrandles’ long-range volley was inches wide of the target. Larne took the lead after 27 minutes. The ball broke to Murray and before the keeper could even think about moving the ball was in the back of the net courtesy of a cracking volley. Dergview were back on level terms 11 minutes before the break. A needless challenge from Chris Rodgers on Andrew Sproule earned the visitors a penalty. Aaron Patterson held his nerve to tuck away the spot-kick at the second time of asking after the referee indicated he hadn’t whistled for the first. Five minutes later Larne restored their lead. Kevin Bradley raced down the right and delivered a pinpoint cross for Maguire to head past Beggs from six yards. The captain then extended the lead within two minutes. This time Keke battled to win the ball and laid it to Maguire and, from what looked like an awkward angle, he drilled the ball into the corner of the net. As the game move into injury time a long-range free-kick from Jude Ballard sailed over Brennan and into the net, taking the shine off the win. 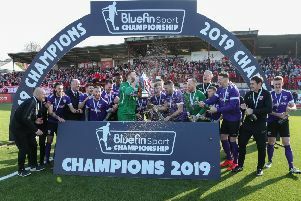 Larne: Brennan, Bradley, McGrandles, Nixon, Rodgers (Calvert 40), McMullan, Irvine (Gillan 86), McIlveen, Murray (McGonnell 89), Maguire, Keke. Subs not used: Robinson, Donnelly.